What would it look like if you had highly engaged representation from all levels of your organization to develop the next strategic plan or product innovation? How can you ensure the best return on your investment of bringing together a large group, in one place and at the same time best leverage their collective wisdom? How might you gain widespread support for a new initiative? In this post, we discuss why a whole system, strength based planning approach is the answer! It is often difficult for organizations to effectively harness the collective wisdom and creativity of their community. It’s now commonplace to have distributed teams with personnel located all over the globe, often working in virtual environments and having only a few sporadic opportunities to come together in person. The significant expense associated with convening a large group of people from various locations requires an organization to justify the value and realize a strong return on this investment. 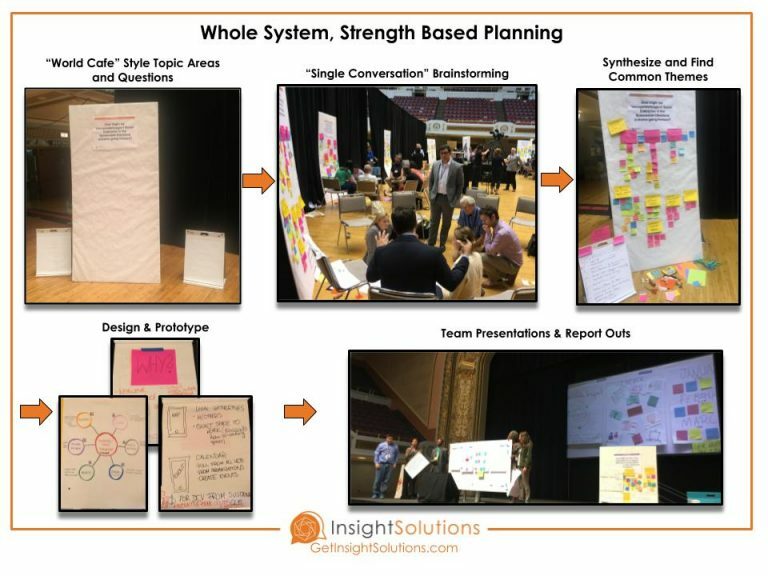 One approach to facilitating a large group event, designed to extract maximum value from the time spent together, is to use a “Whole System, Strength Based Planning” approach. Here are three compelling reasons you should consider this approach for your next meeting, retreat, summit, planning event or strategic convening. 1) People care about what they create. The top down, command and control management style simply doesn’t work in most modern environments. Antiquated management strategies from the industrial age don’t resonate with today’s increasingly millennial workforce, nor do they align well with the knowledge based economy that we have adapted to operate within. “Top down” is outdated, often stifles creativity and may create feelings of resentment, which adds friction to accomplishing strategic goals and implementing plans. At the same time, “bottom up” is not the answer either. A collective, “whole system” approach has been shown as very effective in collaboratively creating solutions that deliver value. “Whole system” means including stakeholders from all levels of the organization. By doing this, you’ll have access and the opportunity to tap into the collective wisdom of the entire community. Offering the freedom and establishing an environment which supports creativity allows people to co-create their own collective solutions, plans and strategies. When these solutions, plans and strategies are products of their own effort, there is a strong sense of ownership and inherent support in seeing them through to successful execution. This approach establishes buy-in, which naturally helps generate support and ultimately leads to an engaged culture who cares about what they have created. 2) Create a culture of inclusion. Inviting the “whole system” to participate inherently creates an environment of inclusion and helps to communicate that all voices in the organization matter. There is a certain magic that can be created when CEO’s, executives, managers, employees, suppliers, partners and customers are given the opportunity to mingle. Rolling up their sleeves, standing side-by-side and solving problems together creates deep connections and allows new learning to take place. Over time, a culture of inclusion will help establish psychological safety, which is a critical element of high performance teams and cultures, according to research conducted by Google. 3) Brainstorm and prototype in real time. In the whole system, strength-based approach, participants actually develop action plans, create solutions and design prototypes in real time. This bias towards taking action seeks to avoid the possible paralysis which can come along with a sole focus on planning and instead challenges groups to be creative in their approach and bring their ideas to life using a variety of formats and tools. Generating tangible outputs means the team co-creates a deliverable to handover at the end of the event. This deliverable can then be acted on further by the appropriate personnel within the organization and refined through a formal development process. It also offers the opportunity for teams to present concepts and designs to the broader group during the event. Team presentations are a great way to gain experience in presenting and also forces the team to anticipate questions or challenges that their ideas may be faced with as they develop further. 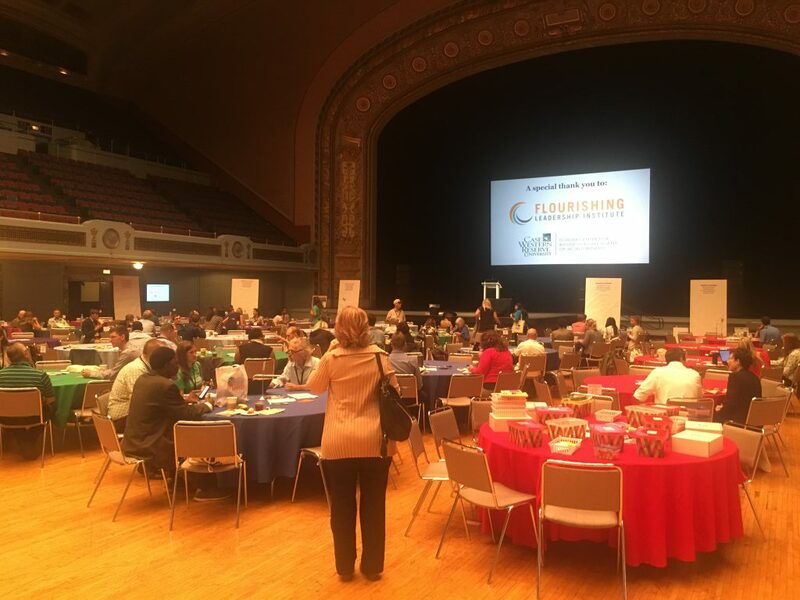 Insight Solutions recently participated as a co-facilitator in the 2018 Sustainable Cleveland event. Over 400 community members came together across two days to imagine and create solutions to support Cleveland’s quest to become a “green city on a blue lake.” An appreciative, strength-based, whole system planning approach was used for this event. As many as 22 “How might we…?” questions were asked across six strategic initiative areas. Participants moved to areas where they felt the most energy to contribute and ad-hoc teams were formed. Teams were then guided through “world cafe” style brainstorming, common themes were synthesized and rapid prototyping took place. This process was facilitated using an appreciative and experiential approach. At the end of the event teams presented their concepts and solutions to the strategic “How might we…?” questions. Presentations included physical 3D models, sketches, concept diagrams, flow charts, development road maps and more. Contact Insight Solutions to learn more about how you can bring a whole system, strength based planning event to your organization. Previous Post 3 Reasons to Join us at DadFit LKN on November 10th Next Post Better, Faster, Stronger!